The batch release method is a rapid and cost-effective approach to sterilizing single or small batches of product needed for clinical or animal trials with minimal sample requirements. The overkill concept using Ethylene Oxide (EO) sterilization is used to demonstrate a sterility assurance level to safely release product. 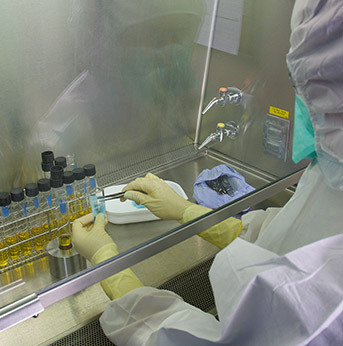 For most products, the batch release method can be performed in small laboratory vessels as well as at contract sterilization facilities and provides the much needed flexibility to get product to trials or to market without the time and expense of waiting for the completion of a full sterilization validation. Alternative to a full validation, this study is used to release a single batch of product. It is a convenient option to provide terminally sterilized products for clinical use when the production volume is small, for new product development or when there is only enough product manufactured to complete one sterilization load. Our sterilization specialists will guide you through prevalidation testing and cycle development, as well as the validation process, routine monitoring, and revalidation requirements. We offer customized protocols and an all-in-one summary final report that includes cycle run data, temperature/humidity distribution studies, a copy of the protocol, a process summary, and all testing results for easy reference. If you have additional questions about Clinical Batch Release Sterilization services , or would like to consult with the experts at Nelson Labs, just send us a request or call us at +1 (801) 290-7500.